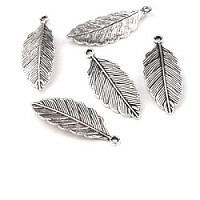 Metal pendant in the shape of richly ribbed leaf is double-sided. The entire pendant looks like a real Leaf. Metal hangers are used primarily on necklaces, bracelets or earrings. Interestingly will excel on a ribbon tied around a candlestick, paper greeting card or a gift box. It is also suitable for making bookmarks or decorative pendants on the purse, bag or key-chain. Specification: jewellery metal with galvanization, nonmagnetic metal.